What is now "Pembroke Fellowship Church" (previously Pembroke Community Reformed Church) came into being as a Sunday School teaching mission station in 1948. Dr. John Bruggers, then minister of the neighboring Wichert Reformed Church-together with a group of dedicated laymen-envisioned and built the original chapel building. These Christian laymen came each Sunday to teach the Word of God to all who would come. Three laymen were assigned the missionary work at the mission: Arthur DeYoung, Peter Salm, and Cornelius Stroo. Rev. Wilson Richardson, A Western Theological Student was asked by Dr. Bruggers to spend a summer ministering to the people of the Pembroke Chapel. Rev. Wilson Richardson and Rev. Samuel Williams, then seminary students were engaged to serve alternate Sundays from 1948-1951 during the school season. Upon graduation from seminary, Mr. Richardson continued as summer extension pastor. The little chapel congregation grew and decided to become a non-denominational church in 1952. Rev. Richardson continued to serve this congregation until 1953, when he was called to serve in Texas. In 1954, Rev. Wilbur Washington came to serve "Pembroke Community Church." Under his pastorate, the first parsonage was built, and in 1957, the chapel congregation voted to become "The Pembroke Community Reformed Church (PCRC)." Rev. Washington's ministry at Pembroke ended in 1959. Rev. Samuel Williams, former student minister from Brewton, Alabama came to serve the congregation in 1960 until 1968. The Rev. Clarence Hoven pastored from 1968 until 1970. The church was then without a pastor for four years. During that time Elder Royal Dee Simington conducted services every Sunday, and with the help of youth director David Moore, held the congregation together until March of 1974 when Rev. Hezekiah Brady, Jr. was called as pulpit supply minister. After three years in this position he sensed the church's need for a pastor and was installed in the position on October 23, 1977. In 1976, the church, after years of financial dependence, became self-supporting. In 1979, the church, realizing the inadequacy of its facility at the time, voted to pursue the possibilities of either adding onto or building a new facility. After more than a year of frustrating experience, the Lord introduced Mr. William Brazley to the Pembroke Church's Consistory. His architectural design was wholeheartedly accepted and on March 14, 1982 ground was broken for the present edifice. Although the original contractors were not able to complete the building we are convinced that they were instruments of God in their performance. God then sent other individuals and used the congregation to complete the work which He had started. The new church was dedicated on October 10, 1982. Rev. Hezekiah Brady led PCRC until his retirement in 1998. The church was then without a pastor for two years, during that time Elder Jimmie I. Stevenson and Deacon Johnny W. Rogers conducted services every Sunday with the help of pulpit supply. Rev. Brian Beverly pastored from 2000 until 2002. The church was then again without a pastor for two years. Elder Jimmie I. Stevenson and Deacon Johnny W. Rogers again conducted services every Sunday with the help of pulpit supply. Rev. Dr. Walter A. McCray served from 2004 until he resigned in 2008. The church was then again without a pastor for a year, again it was held together by Elder Jimmie I. Stevenson and Deacon Johnny W. Rogers, with the help of pulpit supply. Rev. Rodney Lake began leading the congregation in 2009 to the present time. 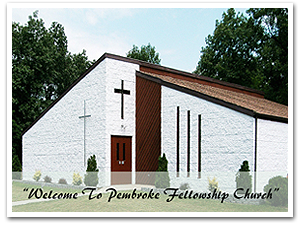 The name was changed in April of 2010 to the Pembroke Fellowship Church.